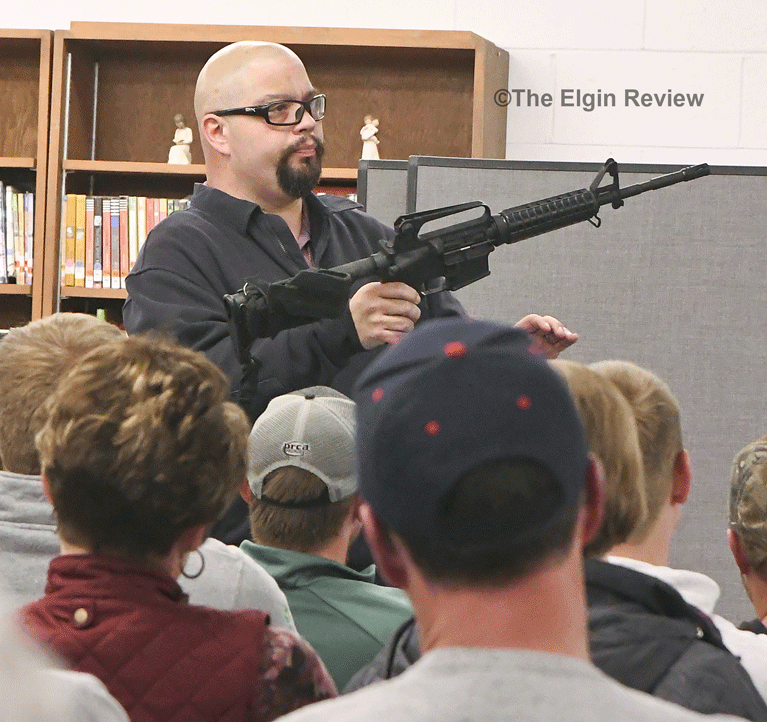 Teachers and administrators from Elgin and other area schools were joined by EMTs and First Responders as well as state and local law enforcement officers Monday night to learn more about what more can be done to prevent school shootings. 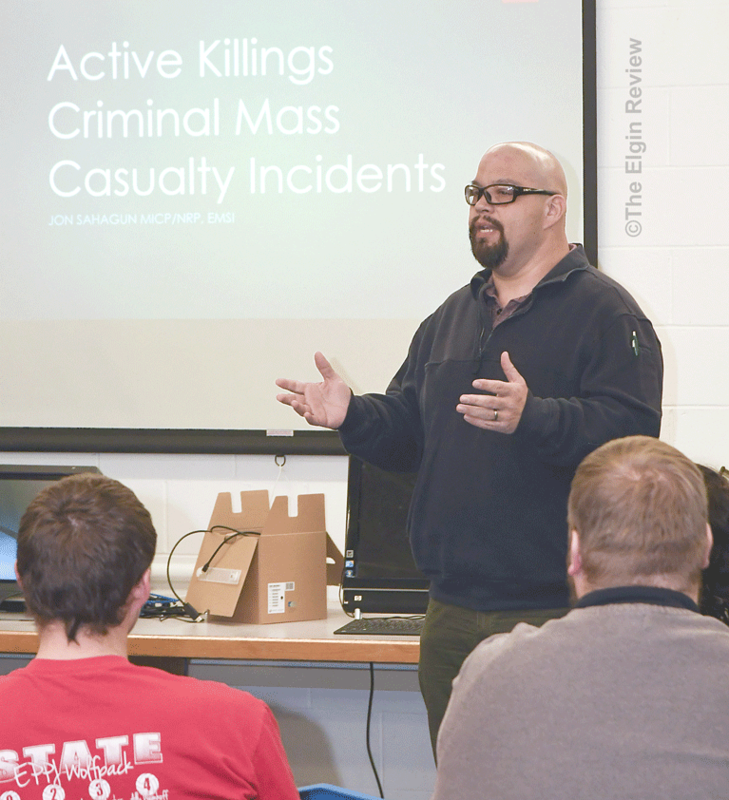 Meeting Monday night, March 26, at Pope John, they (approximately 100) filled the library to near capacity to hear from Bloomfield firefighter/paramedic Jon Sahagun about active killings – criminal mass casualty incidents. They came from Elgin, Neligh, Creighton, Albion, Bartlett, Butte and Pierce to hear his message and to re-examine what needs to be done to save lives should such an incident occur. Saying these type of incidents can happen anywhere (local businesses, etc. ), Sahagun’s focus of the three-hour presentation was on the safety of local schools. “It can happen anywhere, at any time,” he said. The school shooting incidents in Florida and Maryland are just the most recent. “School attacks have been predating this for some time. Shooters, he said, will kill indiscriminately. He then shared a sobering statistic. He said events of this type, whether they take place in schools, businesses, government buildings, etc., from the moment the first shot is fired, until the last shot is fired, statistics have shown these attacks last just under six minutes. Sahagun then asked those in attendance if they were truly prepared to deal with this type of event? Why or why not? Nebraska State Patrol (NSP) officer Andy Moore and Antelope County Sheriff (ACS) Bob Moore then explained how law enforcement is prepared to handle such incidents today. Law enforcement training for these incidents has evolved dating back to the Columbine massacre in 1999. Unfortunately, he added, a member of his department could be 10 minutes away, the State Patrol might be 30 minutes away. “It’s going to be challenging to get a response quickly,” he said noting that should there be a deputy patrolling in the Elgin area, the response time could be quicker. To that end, Sahagun said law enforcement officers are now doing the jobs of SWAT teams from years past. The role of emergency personnel has evolved as well. Sahagun said now EMTs are going in faster than ever before “to save lives.” More able-bodied volunteers are needed. Yet, that’s a problem in nearly rural community, finding people willing to serve as EMTs and First Responders. Elgin is no different. Numbers are low, but that may be changing for the better (see separate story in the Elgin Review). He said three zones are being established to shooting scenes. A “hot zone” where the problem is occurring, a warm zone where law enforcement has been through and found no threats. The third zone, aptly called a “cold zone,” is the location where to stage ambulances, fire service or anyone else. It can be across the street, a block away from the hot zone, depending on the circumstances. Turning his attention back to school teachers and administrators, Sahagun said popular practice through the years has been to get students out of a building if a fire alarm goes off. However, with the Florida shooter, he said the young man pulled the fire alarm and students exited into the hallways, providing more targets. The shooter actually blended in with students to exit the building where he was captured later several blocks away from the school. Sahagun said now, if a fire alarm is pulled, it’s best for teachers to ask students to be quiet while they listen to see if anything is going on in the hallway, then line the students up single file, look out the door to see if the area is clear, then evacuate to the place where they are supposed to gather. To do that, Sahagun said representatives from these groups need to meet to improve collaboration, to better understand the situation at each school because each school is unique. “You’re all stakeholders,” he said at the end of the meeting. Everyone has a connection to the schools (parents, bus drivers, the community at large). Should such a tragedy happen, it will affect all of us. Training is necessary, hopefully for something that will never happen, but all must be ready to respond should that day come. Elgin EMT Dean Schrage said Thursday the idea to hold a class like this in Elgin was, in part, due to the need for re-certification hours. He said he, EMT training leader Gloria Lordemann, along with EMT Vicki Miller coordinated Monday night’s program. This marks the second time Sahagun has spoken to Elgin EMTs. Approximately six months ago, he taught a class about school emergencies for local EMTs. “He hit all the points for the types of people who were there Monday night (firemen, EMTs, teachers and law enforcement). Schrage said he’s looking forward to meeting with representatives from these groups to better formulate a response to these type of events, to save more lives should this ever take place here. 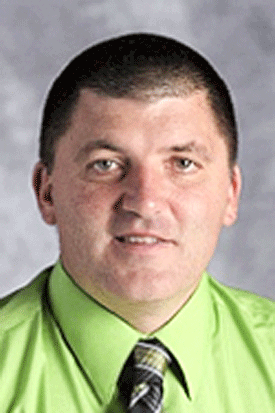 Those meetings, Schrage said, are likely to take place before school lets out for the summer. “Think about what will happen, what you can do in this situation,” will be the focus of the upcoming meetings. Elgin Public Schools Principal Greg Wemhoff. Just days after the Monday night workshop, Elgin Public Schools participated in a “lock-down” drill as part of continuing safety preparedness at the school. K-12 Principal Greg Wemhoff, one of the school administrators at Monday night’s meeting, said safety is a “constant concern for us.” He said such drills are conducted twice a year, yet he said more must be done. 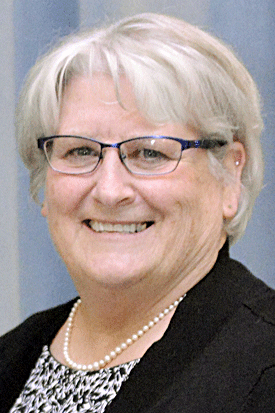 Safety was briefly touched on by school administration at last month’s meeting of the District #18 Board of Education. EPS has several buildings in which to maintain security and, no doubt, that will be an issue discussed when representatives from the school, law enforcement, emergency medical responders meet in the future. St. Boniface Elementary School and Pope John XXIII Central Catholic High School Principal Betty Getzfred. Students had just left for Easter Break Thursday afternoon when PJCC/St. Boniface Principal Betty Getzfred spoke to The Elgin Review about her reaction to Monday night’s meeting. While pre-school, elementary and high school students are all in one building, she said the school has other security issues which she’s looking forward to addressing with representatives from law enforcement and emergency personnel. Windows are a main concern, she said. So, in the simplest of terms, Sahagun offered tips for people who happen to be in the wrong place at the wrong time should such an incident occur. 1. If in an office or room and you hear shots, the best alternative is to run, providing a clear path to an exit is available. Once outside, don’t stop running, he said, when clear contact ‘911’. 2. If you can’t exit the room you’re in, lock the door, barricade it if possible, stay close to the ground and find cover. 3. If confronted, “fight for your life,” he said. “Do not hold back.” He said look for any object, a stapler, anything that you can throw or strike the shooter with. The best time, Sahagun said, to confront the shooter is when that person is changing the magazine in the weapon. “Prioritize your safety,” he said.